There's a lot to keep track of when writing a book or novel, from characters to small plot details. If your desk is not full of pieces of paper with all sorts of scribbles, then you're either doing something wrong or you've decided to use Dabble to organize everything. While there are many text editors that focus on letting you write without distractions, this one, in particular, brings much more to the table. It looks quite simple on the surface, but it does some things that advanced word processors aren't capable of. One of the most important aspects is the fact that it gives you the possibility of writing a book in a comfortable manner without anything getting in your way and distracting you from your work, while still being able to enjoy a series of advanced functions. The software has monthly and yearly payment plans, but a 15-day trial is available, which doesn't have any kind of functional limitations. You can download and install Dabble like any other Windows application, in just a few seconds, without making any complicated settings. It works on all modern Windows versions, without relying on any third-party tools or services, and it doesn't use a significant amount of memory or processing power. The design of the user interface is definitely worth mentioning. The choice of colors, its auto-fade animations, as well as the optional dark mode, really make Dabble one of the most comfortable word processors out there. It provides you with a wide range of controls, which are well organized and easy to master, but the most important part is that you won't have to deal with them while working. Once you start writing, everything around the main editing area will slowly fade out, leaving you with nothing but the page your working on and a light-grey background. If you need to consult with your notes or change some settings, everything will fade back in when you move the mouse. Thanks to the software's predefined headings, you can write the book's title, author and chapter titles without having to change the font settings each time. Just place the cursor where it says "Chapter" or "Title" and your settings will be made automatically, depending on what line you're on. However, this is just scratching the surface of what Dabble has to offer. If you need to plan out your book's plot, characters, scenes and other elements, you can do so on the same interface, in different sections, which you can access in a navigation pane, on the left side of the user interface. An interesting feature is the possibility of writing notes and arranging them in a grid, which is particularly useful if you're working on multiple plot lines. You can also create story-related notes, character sheets, and type in details regarding the world-building aspect of your book. What's more, the software lets you create your own folders in the aforementioned navigation pane, so you can write down anything you can that comes to your mind. If productivity is one of your concerns, you can rely on Dabble's stat tracking capabilities to see how much you've worked in the last period, establish goals and keep track of your progress. You can specify how many words you want to write each day, as well as the days on which you plan to take a break, to make the tracking more accurate and relevant. Furthermore, if you're away from your computer and need to work on a different machine, you can log into your Dabble online account, where you will find all your work synchronized with the server, so you may continue from where you've left off. Dabble combines the best of lightweight word processors and the weaknesses of none, to bring you one of the best and most comfortable writing environments you will work in. The software's user interface is well-designed, pleasant to look at, and its controls are highly responsive. It lets you work without any distractions. You can organize plot points, characters and anything else you need to remember and use later. It is also possible to create goals and track your progress. 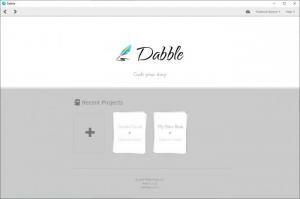 You can download Dabble free here.